Yesterday I attempted to travel back from London to Stoke and ended up not being able to do so. Trains cancelled, other trains delayed, all trains packed out, complete chaos and unseemly meltdown. I'd been at a conference all day and by lunchtime the rumour was flying around the delegates "If you're going to travel, travel now or you wont make it". Like a sheep I took this at face value and darted off a good three hours before my booked train. Lo and behold, Virgin trains had lifted all ticket restrictions and appeared to be packing punters on to any train they could. I went to the desk and was told by the girl to "get on the 4pm" train which was scheduled next - even though I was not scheduled to travel until 6.20pm. I did so and it was akin to something out of a rushed urban evacuation, punters packing on, pushing each other fighting over seats. In the end, I got off - unable to face a two hour journey like this. It struck me that Virgin had contributed to this by playing along with the panic. People had been panicking, so Virgin panicked in response and in the end there was a huge mess. As it was, there was no need for it - if everyone had just travelled at the normal time they had planned, they would have been a bit late and crammed but generally fine. The Met Office "red alerts" on the weather, the rolling news hysteria - see Sky News' "UK Snow" graphic - all has the effect of winding up the population and the services on which we rely to new and frightening levels of anxiety. I am certain it never used to be this bad when snow fell, but each time it comes we do seem to get worse and worse. I agree this has nothing to do with the "liberal rot" you talk about, but everything to do with the rule of fear and pessimism by our elite. But it's not all bad - I think this "carnivalesque" notion is not far off the mark either. What is interesting is this fury from many of the right wing commentariat who rage that people need to buck their ideas up and get to work and stop being so soft etc...etc... It is clear the boss class are sensing that the annual snowmaggedon has become symbolic of many workers simply not working. The "Snow Day" concept is really quite a new thing. Given that we are working some of the longest hours for ever decreasing wages in this country, coupled with the crippling of trade unions, I do feel the snow is now one of the few events that gives people the chance to collectively down tools and stop working. I would hazard that if workers had decent wages and annual leave entitlements, not to mention more equal industrial relations mechanisms, they would be far more likely to fight their way through the snow to go to work. As it stands, snow offers workers one of the few remaining "excuses" to throw caution to the wind and not turn up. I think this is all media stuff and in the real world people do go out and enjoy the snow and don't think the end of the world is nigh. DON'T BELIEVE THE HYPE: The media DO NOT speak for the people. Loz, I'm pretty sure things didn't used to be that bad either - though I'm happy to be proven wrong. IT seems to me snowmageddon has properly become a thing since the 2003/4 winter where a lot of local authorities, Stoke included, were caught on the hop by snow that immediately froze. 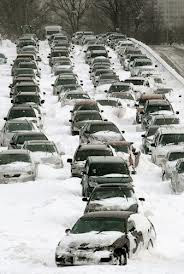 I can remember many roads across the country becoming ice rinks and cars and buses getting abandoned by the thousands. I'm just waiting for the BBC to attribute the oncoming 'triple dip' to the snow. Nothing to do with fiscal or monetary policy, the gutting of demand, etc. It's the snow that's responsible. The moral and intellectual level of mainstream journalism continues on its downward trajecteory.